Totally meatless, dairy-free, packed with flavor, and served up in a crispy (baked!) tortilla bowl! 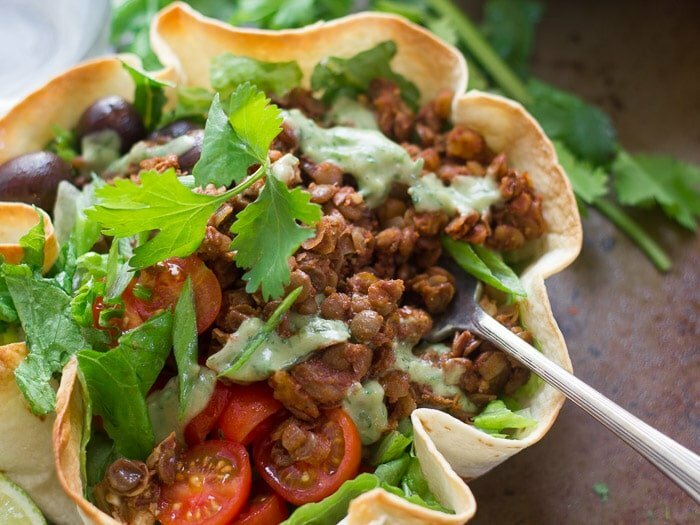 A zesty lentil walnut mix takes the place of meat in this scrumptious vegan taco salad! I don’t post many salad recipes on this site, and that’s because you guys don’t seem to get super excited over salads. I totally understand! I eat a ton of salad, but I don’t generally get super excited over it either. I don’t tend to click on salad recipes I see on the internet. A salad’s a salad, you know? I’m pretty capable of putting one together, and I don’t need some blogger to tell me how. In order for me to get really excited about a salad, it has to be pretty darn special. This salad is just about as special as it gets. This “meat” is super easy to make. 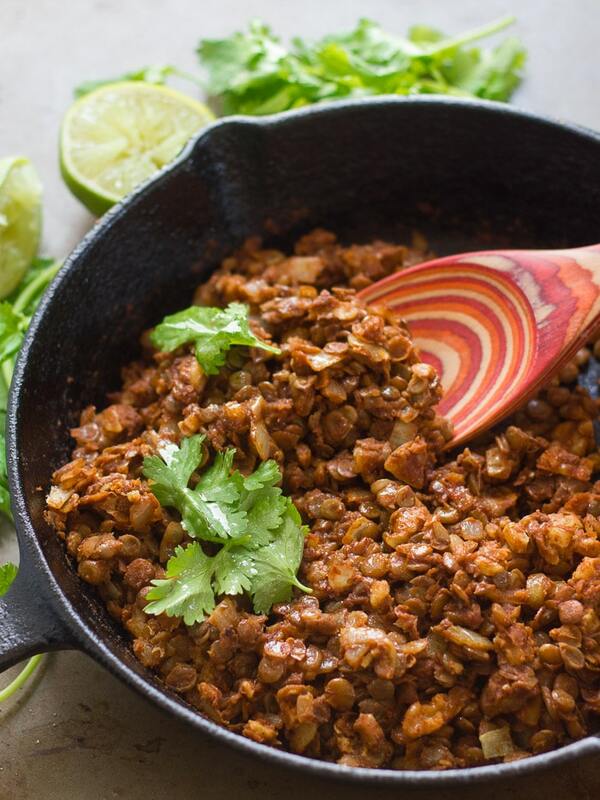 You’ll just be sizzling up some chopped walnuts and lentils in a skillet with pretty much the same spices one might use to make non-vegan taco meat. Then there’s the crispy shell. Super important! When I waited tables in my younger days I worked at a place where we dished up taco salads in greasy fried taco bowls, and everybody loved them. In fact, more often than not, the customer would polish off the shell and leave me a plate of veggies to haul away. We’re not going to do that, because the fillings for these salads are way better than the ones I served up way back when, but the shell’s great too! You’ll eat the whole salad, if you can fit it, I’m sure! 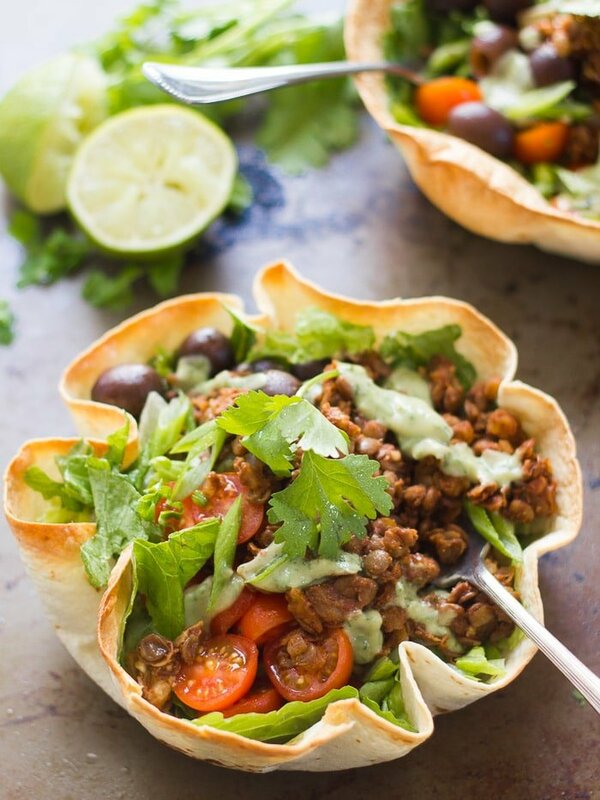 Instead of frying these taco bowls, you bake them. (I can’t take credit for the idea, I’ve seen this done all over the internet for years, and used some guidance from this tutorial when making these bowls.) Just spritz a big flour tortilla with cooking spray, drape it into an oven safe bowl, and bake. You can also drape it into a tortilla bowl pan if you want super perfect looking bowls (obviously I didn’t go that route). Either way, it won’t be as crispy as something that’s been fried like crazy, but it’ll be delicious, and you’ll feel way better after eating it. The taco meat is about a medium level of spicy by typical standards. If you’d like it to be milder, cut back in the ancho chile powder. If you prefer it spicier, add more ancho or some bottled hot sauce. Canned lentils work great here if you can find them. If you cook your own lentils, be sure not to overcook them so they don’t get too mushy. Just cover them with water in a saucepan and simmer uncovered for about 20 minutes. 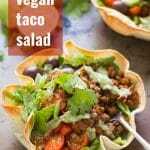 The vegan taco meat portion of this recipe can easily be prepared a day or two in advance. I recommend mixing the dressing and baking the bowls just before serving. Preheat the oven to 400°. Use a mister or cooking spray to lightly coat both sides of a tortilla with oil. Drape it into a large oven safe bowl, or you can use a tortilla bowl pan. Repeat for the remaining tortillas. (You can work in batches if you need to. I used a couple of small stainless steel mixing bowls, and baked the tortillas 2 at a time). Bake until the tortillas are lightly browned around the edges, about 12 minutes. Carefully remove the bowls from the oven and allow to cool for a couple of minutes before removing the tortillas. Coat the bottom of a large skillet with oil and place it over medium heat. Once the oil is hot, add the onion and sauté until translucent, about 5 minutes. Add the garlic and saute 1 minute more, until very fragrant. Add the lentils, walnuts, soy sauce, liquid smoke, cumin, ancho chile powder, cayenne pepper, and black pepper to the skillet. Cook until the mixture dries up a bit, about 5 minutes, flipping occasionally and very gently with a spatula. Add the tomato sauce and cook about 2 minutes more. Season with salt to taste if desired. Place the avocado, milk, lime juice, and garlic into a blender and blend until smooth. Add the parsley, cilantro, and chives. Pulse until everything is finely chopped and mixed into the dressing. Season with salt to taste. 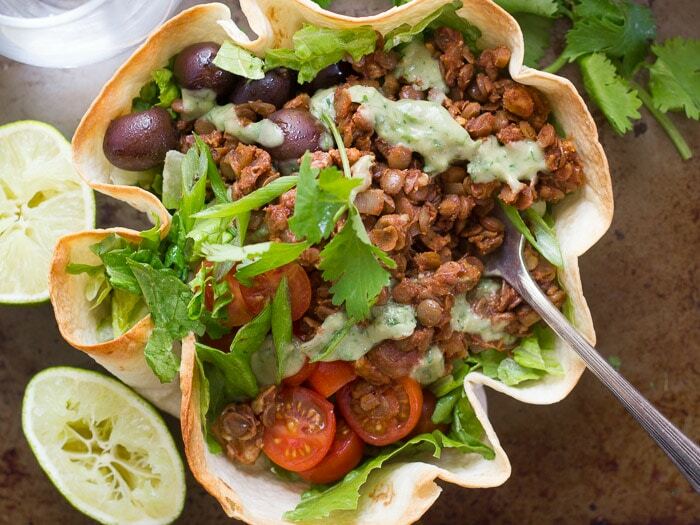 Divide the greens, cherry tomatoes, and olives among the tortilla bowls. Top with lentil walnut filling, a scoop of salsa, avocado ranch dressing, and any other taco fixings you'd like to use. Serve. ooooh. this looks so good and filling — and cheap! i love your trippy-lookin’ wooden spoon. We made this last night – and it was fantastic! 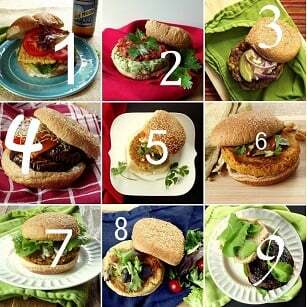 Thank you for posting vegan recipes that taste great! Yay! Glad you enjoyed it!! Also, we didn’t use liquid smoke, parsley, or chives, and I used just regular chili powder instead of ancho chili powder (because I didn’t have any of these ingredients on hand). We bought Trader Joe’s steamed lentils in the package, which made it even easier! Cheers! I don’t have lentils on hand. But I love TVP and have a whole bag. Do you know how I could use TVP in this recipe ? I think you could get it to work with TVP, but I can’t say for sure without trying. I’d probably just substitute an equal amount of TVP for the cooked lentils. DEEEEELISHUS!!!! I made this tonite and it was so good. still my tummy feels all warm and happy :) subbed a can of pinto beans for half the lentils but followed everything else to a t. served in cristpy taco shells with lettuce, tomato and my homemade jalapeño cashew ricotta. I will keep this in my favorites file!! thanks for another keeper !! Made this today. Easy to put together and more important flavorful. Am in love with the recipe and will certainly be making it again. I’m so glad to hear that! Thanks AJ! I can’t believe how much this looks like meat! I’ll definitely be adding this to my veggie burrito bowl tonight, thanks for the recipe! Oh, great idea! I’d love to hear how it works out! That’s a lot of salt for one meal. Would using amino acids be alright to substitute? Also I have green lentils. I saw the comment about the red, what’s different about green and brown? Thanks! This looks delicious. Liquid aminios would be just fine, adn I usually have good luck swapping green lentils for brown, so I think that would work! Enjoy! I overcooked my lentils by accident so I added a bit more walnuts, even with the mishap this recipe was still delicious! I also didn’t have any liquid smoke, instead I added smoked paprika instead?, but again it was delicious. Everyone in my family loved it! Yay! Impovization win! I’m so glad you and the family enjoyed it! This looks delicious! One quick question… Can I make the dressing the night before? I always worry with avocados and the browning that occurs. This looks amazing! We have a nut allergy in the house…any suggestions for replacing the walnuts?